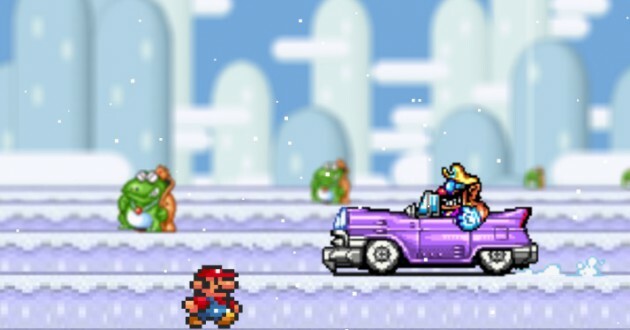 In Mario Snow 2 you play you around in an icy landscape, trying desperately to evade the attackers. For this, different levels are available. Endure as long as possible and try not to fall into the hands of your enemies. They still want to push you into a deep hole, which is no nice. Have fun with Mario Snow 2. The game is played with the arrow keys (cursor keys) on the keyboard. Here you can either move up and down the paths, or use the left and right arrows to run faster or slower. While you walk you can see on the top left that you are accumulating more and more points. The game is actually nicely made, but for advanced players, it is unfortunately boring. Here one might still be able to install some things to jump. The graphics are okay, the as far as the sound goes, it is just lacking in long-term motivation. A somewhat different Mario game, but whoever wants to try it is more than welcome. Do you like Mario Snow 2? If you like Mario Snow 2, please click on the Facebook Like Button. With help of the likes on games, we generate our top 10 charts.